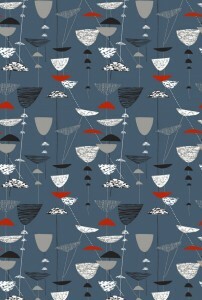 Lucienne Day’s fresh and progressive textile designs were revolutionary, epitomised by her most famous 1951 Calyx design which was showcased at the 1951 Festival of Britain. Inspired by plant forms, composed of spindly lines and irregular cupped motifs in earthy and acid tones, the abstract design was initially viewed with scepticism by her principal client, Heal Fabrics. However Calyx was so widely praised, nationally and internationally – even receiving the International Design award – that the company enthusiastically embraced the ‘Contemporary’ style and championed Lucienne’s work. The originality of these early patterns grew from Lucienne’s love of modern art, particularly the paintings of Joan Miró and Paul Klee. An inspired colourist, she sought to create a similar energy and vitality in her patterns as in 1952’s Flotilla and Small Hours and bold colour contrasts such as the 1956 Herb Antony (featured in the show). Over the next 20 years Lucienne produced over 70 outstanding patterns for Heal’s, all remarkable for their inventiveness and much sought after by other textile companies, including Edinburgh Weavers, Liberty and British Celanese. The playfulness of her early patterns was replaced in the late 1950s by a growing interest in vertical compositions, as seen in Sequoia from 1959. After a series of textural patterns during the early 1960s, her designs became bolder, simpler and flatter, as in 1965’s High Noon. Several of her later designs had full-width repeats, such as 1967’s Causeway designed specifically for the large floor-to-ceiling picture windows then in vogue. We are grateful to Lesley Jackson for permission to draw on her research in this information.